Well, I’m officially back from vacation now and am eager to get back into writing more Roleplaying Tips issues. I’ll be diving into the couple hundred or so emails that backed-up in my Inbox during my trip and hope to get my replies to you caught up this week. I’ve posted this issue in my About.com forums for your immediate and public feedback, responses, and tips additions. Feel free to continue sending me private emails, but also use the forum to share your thoughts about this issue with others. Traps are also a mind game. The party will change its expectations according to what they get. Standard traps that form a pattern could make a party change its marching order correspondingly. Traps may take advantage of this by building patterns of expectation and then pulling occasional surprises.A trap can be thought of in terms of their Quality, Cost, Delivery, Safety, and Morale (QCDSM, another consultants’ tool that has multiple uses in evaluating and developing various issues). High quality traps can remain reliable and operative for a long time even without maintenance. They are economical to build and deliver their effect exactly when, where, and how they should. They are safe to handle by those not intended as their targets, and in accordance with the morale of those who designed, paid for, built, and live near them. Of course, not all traps are high-quality traps. They can fail in one or more of the five key ways, even all of them.In order to work, a trap needs to be able to monitor the conditions around it in some way (trigger). It needs a way to deliver the response (effect), and some way to combine the two (connection). Those three can to some extent merge in simple traps, or they can be fully separate. A simple trap might be a door handle covered by contact poison. It detects attempts to open the door, and has the prepared response of poisoning the intruder. The connection is rather immediate. Some traps cost little to build, others plenty. They also take ingenuity and can be a hazard for those (if any) who live in the area where the trap is placed. Doors are cheaper and simpler, even hidden ones, and a trap that is bypassed or otherwise avoided is a missed investment.A trap that is triggered can also be a missed investment if it does not stop the intrusion: it makes little difference to the victim of a robbery whether his treasure is divided between four or five thieves. Thus, traps should be used with care and mainly in places where they are either very visible and deter intruders, or in places where they are difficult to avoid.Keeping cost effectiveness in mind is not the same as keeping all traps in the campaign cheap yet deadly. Some who pay for traps have a craving for the feeling of security or self-importance derived from being surrounded by traps. Some build traps instinctively. Others simply love traps – collecting them, designing them, building them, owning them. Some need to protect something with desperate intensity, and are ready to go to great lengths to increase its protection.Some simply have plenty of resources in their hands, enough to make the cost of traps irrelevant. Pharaohs of ancient Egypt certainly did, hence the pyramids and the traps in them – of course, they were also highly motivated as they had the afterlife to worry about.The lair of a lich would certainly be well defended with defensive traps, mainly but not exclusively magical. A lich is typically, after all, powerful, solitary, and smart, and thus not very eager to risk eternity by winding up in a melee with an adventuring party. Who knows, the adventurers might have uncovered some hidden weakness, have special resources, or simply get lucky. So why take unnecessary chances when summoned creatures and traps can do the work of defending the lair from routine hazards without putting the lich itself at risk? Of course, eternity can get boring, so an especially interesting and resourceful party of adventurers might be granted the special honor of being slain by the lich itself. Those who paid for a tomb trap are likely to have wanted the rest of the deceased never to be disturbed again so there is no need to pull punches. Tomb traps can be built without worrying about innocent bystanders: any who trigger the trap are almost certainly grave robbers, and thus people that the trap builders would like to see destroyed or trapped forever. Tombs are often contained and fairly small. This makes it harder to avoid the traps. For reasons such as these, tomb traps can be made unusually cost effective.Further, with tombs costs are not necessarily an issue. The graves of the rich and powerful sometimes see a great investment of funds, as they are the last chance of the deceased to spend money on himself. Those who inherit the money and the power can make grave traps elaborate, deadly, expensive, beautiful.. and may be unusually inclined to do so. They are not actually spending their own money, but their predecessor’s. It can well be politically convenient for a person to provide his predecessor with a wondrous grave, complete with truly fiendish traps.Religion is also a factor, as it always is when concerning transition into afterlife.If you have a particularly wicked trap in mind and no place for it, perhaps it could be guarding a tomb. Many traps work when something is touched or moved. They tend to be triggered by doors opened, tripwires pulled, weights placed on pressure plates, objects touched or moved. Yet not all.Traps can respond to light sources, sounds, presence or absence of life in an area, a person dying…just about anything, given sufficient resources and motivation. Magic and ingenuity provide plentiful options.Mindless undead creatures are especially useful as trap triggers. They are relatively inexpensive, and much more versatile at detecting intrusion than most simple traps. All they need is to detect the presence of the party and they will strive to do what they were instructed to do. Attacking is simple, and in most cases not very effective. Manually triggering traps, using single-shot or limited-charge magic items are other, far more deadly options.If your players are used to believing that everything is safe as long as they don’t touch it, perhaps they should be shown wrong. Traps are but a part of the environmental hazards that adventurers face. The areas where treasure is to be expected is seldom clean. There can be piles of rubble and trash, even cave-ins. Passages can be covered with grime and soot. They can be dark, and they may have bad air conditioning or poisonous air. Corridors can have sections missing, have uneven floors, missing ceilings, missing roofs.Deadfalls, cave-ins and falling walls are a risk even in areas that have not been intentionally trapped. Not all passages are meant to be walked in; they can be slanted in the most awkward angles, flooded, and far from the standard size.The luxury of horizontal, smooth, clean, trap-free, wide passages applies mainly to areas where roughly man-sized people with an appropriate philosophy on life have recently dwelled or still do. For obvious reasons, adventurers may have reasons to avoid those areas. Further, not all people are human-sized. The home of a giant, or the dwelling of a tribe of goblins is not likely to be easy for standard-sized adventurers to walk in. 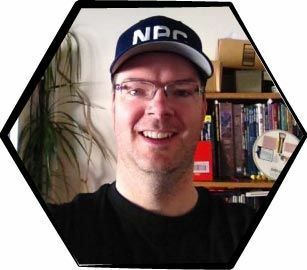 About the author: Aki Halme has been involved in rpg’s for the past 17 years. His gaming experience includes playing, running, and designing various games, including ccg’s, tabletop games, live-action games, and PBeMs. He’s currently getting his Masters’ degree in engineering and physics, the very two things he has never studied. Also, since I am using a game system in which there is an Initiative roll at the beginning of a round, I found a way to be sure that all players have made their move before moving to the next round. I made a circle out of cardboard and painted it green on one side and red on the other. At the beginning of a round of action all players switch their “puck” to green. That means that they can do their move. When it’s done, the puck is flipped to the red side and when all players are red, I move to the next round. In conjunction with the puck system, I have a wizard who always needs a precise amount of rounds to cast spell and for the spell’s duration. We bought a small handheld counter for golf players. It cost about $3CDN and at each turn, we press the button to increase the round number. Since there are two indicators we can count two different actions easily. Here is another tip. In TV or radio, the last thing that we remember will be the last thing we heard. That’s why in many jingles, we hear the brand name at the end, or see the logo. I do the same thing with description. Hi Johnn, The latest issue was great. Since you were asking for a few GM tips, I thought I’d chime in. The first tip was given to me by a fellow GM years ago and it’s worked well for me: For plot development, nothing stimulates the creative juices for me more than having the NPCs named beforehand. Having a name for an NPC starts one to imagine their personality and motives more vividly, which in turn helps the GM develop the plot based on the motives of the NPC. Keep index cards with the PCs skills (as well as their chance of success) handy so you can roll for them without their knowledge when appropriate. It’s very useful for testing passive awareness skills. And if all else fails, don’t overlook your game’s encounter tables. You might save yourself a lot of time. Both Rolemaster (a short one in GM Law) and especially HarnMaster 2nd edition have excellent encounter and event tables. My gaming group (most of the players were new to the game) generally prefers roleplaying to roll-playing. We would often go several gaming sessions without a stand-up fight. The players seemed to like it just fine that way. We didn’t get bogged down in rules, and the game flowed somewhat smoothly. However, one night, I had neglected to prepare for the night’s adventure and (at that time not being very well versed at impromptu role playing) ended up with a night filled with just random encounters. About ten hours of random encounters. You would think that my group would have hated it, but they found it quite enjoyable as a break from our normal gaming style without changing campaigns or game systems. After such a night I became much better at impromptu DM’ing and we have decent fights much more often, but the group still enjoys mostly roleplaying. So don’t be afraid to try something new within the confines of a gaming system, changing gaming styles can make the same-old same-old, seem new again.